Yerba Buena Celebration Jazz Band at Farnborough Jazz Club (Kent) on 3rd June 2016. 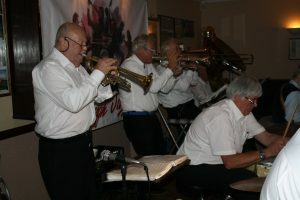 (LtoR) Mike Barry (2nd trumpet&vocals), Dave Rance (1st trumpet&vocals) & George ‘Kid’ Tidiman (trombone) & Pete Lay (drums). Photo by Mike Witt. It’s exactly a year ago since ‘YERBA BUENA CELEBRATION JAZZ BAND’ appeared here at FARNBOROUGH JAZZ CLUB (3rd June to be exact) and now they will return tonight, Friday 2nd June 2017. This amazing 8-pce jazz band base their style on the great ‘Lu Watters’ Yerba Buena Jazz Band. The guys in the band will be DAVE RANCE on 1st trumpet, plus he sings, MIKE BARRY is on 2nd trumpet, who also sings. then there’s GOFF DUBBER on clarinet, plus GEORGE ‘KID’ TIDIMAN on trombone (‘Kid’ was in their original band), plus pianist HUGH CROZIER, including drummer PETE LAY, and JOHN ARTHY on tuba and certainly not least NICK SINGER playing banjo. There you go, you just cannot miss this one. Last year, you all came out of the woodwork to listen to them and we expect to see you all again this time too. So get there early and I know you will enjoy yourselves, especially for dancing. We don’t lie here – enjoy our ‘live’ jazz. This entry was posted in Yerba Buena Celebration Jazz Band on June 2, 2017 by Diane.